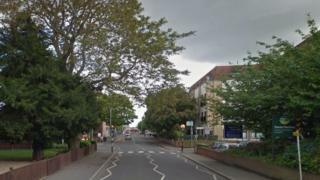 A 21-year-old woman died when she was struck by a car in south-west London. The pedestrian was pronounced dead at the scene shortly after midnight after the collision on Coombe Road in New Malden. The 27-year-old driver of the Seat Leon stopped at the scene and was later arrested on suspicion of causing death by dangerous driving. He was taken to a south London police station where he is being held in custody, the Metropolitan Police said. Road closures and cordons are in place after the crash and buses have been diverted. Inquiries to trace the next of kin of the woman are under way.